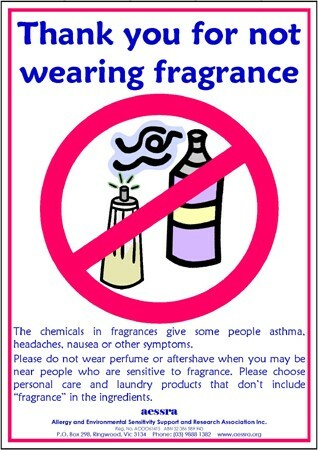 Some people are allergic or sensitive to one or more fragrance ingredients. 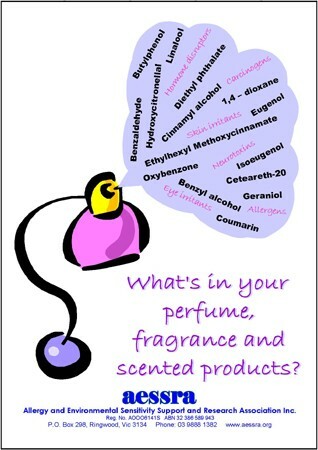 Some get symptoms when they use a product containing fragrance. Others also get symptoms when someone around them is wearing fragrance or when there is fragrance in a room from a cleaning product, "air freshener" or other source. Most fragrance ingredients are derived from petroleum. Some are known or probable carcinogens (substances that cause cancer), neurotoxins and/or known or suspected hormone disruptors. Many have not had adequate safety testing. You can also request copies of the AESSRA brochures about fragrance. To do this you can tick the boxes on the membership form when you join AESSRA Inc. or use the contact form.